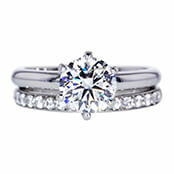 Value: We get you the highest price for your engagement ring using our auction platform. Trust: We hold a Secondhand Dealer's License issued by the New York City Department of Consumer Affairs and are highly accredited by the BBB. Specialization: We strive to be the best in our industry, and that means having your diamond graded at GIA, the Gemological Institute of America, prior to auction. GIA is the industry's leading grading lab that established the diamond grading system and continues to raise industry grading standards. It is well known in the diamond industry that GIA graded diamonds are worth more and diamond buyers are willing to pay more for a diamond with GIA certification. Simplicity: We realize that when you sell an engagement ring, it may be a sensitive situation, and you want the process to be as simple, professional, and accommodating as possible. We are here to give you the attention and care that you need. 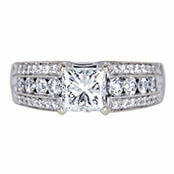 Describe your engagement ring (diamond color, carat weight, clarity, size & grade) and upload a few photos of it. Based on the provided information, we’ll conduct a market value analysis, resulting in a trending market price. We’ll provide you with a fully insured FedEx shipping label addressed to our headquarters. When your ring arrives we will photograph it and have it professionally graded at the GIA laboratory located near our offices. The e-Diamond report and professional photos will be made available to you and the buyers interested in bidding on your ring. 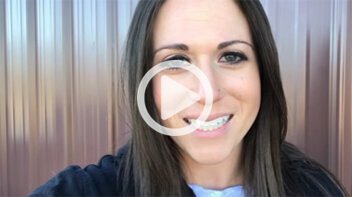 All you have to do is sit back, relax, and watch the offers roll in with the live auction viewer. Approve the final bid, and the money is yours! It was a great experience from beginning to end. In addition to being a “girl’s best friend”, when it comes to value, diamonds are also the appraiser’s best friend. While some engagement rings are set with non-traditional stones such as ruby and sapphire, the vast majority of, and the most popular rings, are set with diamonds. When you sell an engagement ring, it is important to understand how diamonds are valued. Cut: Diamonds come in many shapes, and the cut of the diamond actually refers to the types and number of facets, or edges, on the diamond. The number of facets, and the angle in which they are cut, greatly affects how the light is reflected within and outside of the diamond. Translation: A high quality cut produces, a shiny, sparkling diamond. Color: While diamonds naturally occur in many colors, white and colorless (clear) diamonds are typically used in engagement rings, and are usually the most valuable. The clearer a diamond is, the easier it is for light to pass through its surface, and be reflected back outside of the diamond. Determining the color of the diamond is one of the main reasons professional diamond grading is necessary. The change from one grade to another is extremely subtle and difficult to differentiate by the untrained eye. We only trust the best diamond grading lab in the world, GIA, to grade valuables prior to auction. Diamonds sold with GIA grading reports are considered more valuable and can command higher prices. Clarity: Nearly all precious gems, including diamonds, contain inclusions, or microscopic defects. The more inclusions a diamond has, the less light can easily pass through the diamond. Clarity refers to the number of defects, or inclusions, in the diamond. Diamonds with zero defects are extremely rare. Even diamonds with just a few inclusions can be extraordinarily valuable. Carat: The carat, or weight of the diamond, is one of the most cited and important factors that determines value when you sell your engagement ring. The larger the carat of the diamond, the more rare, and more valuable, it becomes. While carats refer to weight, the heavier the diamond, the larger it is, which is why many people tend to think of carats as referring to size. In addition to cut, color, clarity, and carat, a diamond’s value can also be significantly determined by its shape. A particular shape of diamond might be worth less while it is out of style in one period, and then significantly rise in value when the shape comes back into style. Of course, we can’t forget that the ring itself, depending on which type of precious metal it is constructed of, can increase the value of the ring as well. Should You Consider Local Options For Selling Your Engagement Ring? While you may be tempted to go to your local jeweler, you should take into consideration that they, as trustworthy as they are, have a business to run. The likelihood of your local jeweler giving you a high offer is entirely dependent on the conditions of the market and the popularity of your engagement ring style at the time. The buying power of a single buyer, especially one who is more in the business of selling jewelry, is quite limited. It is likely that you can lose money when you sell to a local jeweler or even more so, a local pawn shop. When you work with Worthy, you are able to obtain offers from many buyers, who will ultimately compete for your diamond. So when you are searching for diamond buyers or jewelers near you, know that Worthy brings the market to you, no matter where you are. How Does Worthy Get You the Highest Offer When You Sell an Engagement Ring? 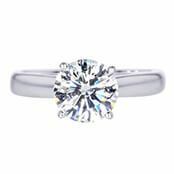 We utilize a proprietary auction platform that puts your engagement ring in front of hundreds of interested buyers across the world who are ready to buy your engagement ring. We strive to maintain efficient business operations, low overhead costs, and make sure to extend those savings on to our valued clients. We chose the leading diamond grading labs, GIA and GSI, ensuring that our evaluation process is based on the highest standards. Our complimentary diamond grading reports give us a vast advantage over the competition and are carried out at no cost to you.